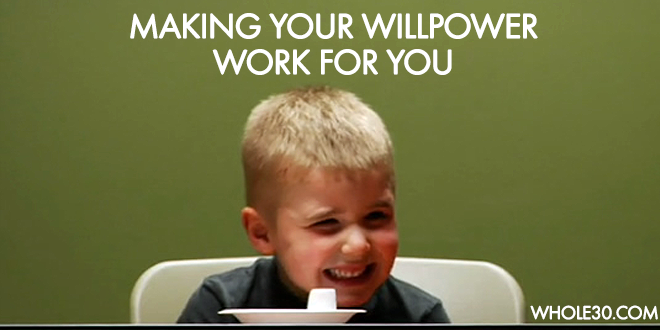 When you think of “willpower,” what’s the scenario that comes to mind? It’s probably passing on dessert after dinner or walking right past the candy dish at the office. But willpower is about a lot more than food—and understanding what willpower is and how it works can go a long way towards resisting temptation and keeping yourself on a healthy path. Willpower is the ability to delay immediate gratification in the name of long-term goals. Think of it as self-regulation—more simply, resisting temptation. Our brains want to take the path of least resistance to whatever reward is lurking right around the corner. It’s easier (and more rewarding) to sit on the couch watching Game of Thrones than it is to pick up the house. It’s tastier (for the first few bites) to eat the cookies now and worry about your diet later. It feels better (in the moment) to snap at your boss for taking credit for your idea, rather than biting your tongue and waiting for the right time to broach the subject. Turning off the TV, passing on the cookie, and holding your tongue all rely on willpower. In fact, any time you resist temptation or immediate gratification (like in each of the following scenarios), you are exerting willpower. The problem is that in today’s modern world, we’re bombarded with both temptation and reward on an hourly basis (if not more frequently). If you start spending your willpower dollars before you’re even out of bed, where do you think your balance will be by the time you get home from a tough day at the office? It’s no wonder most of us struggle with making good choices (skipping dessert or treats, staying off our computers and phones, and turning off the TV) late at night. Poor diet and lifestyle choices also impact our ability to make good decisions, and our willpower. Over-consuming “foods with no brakes”* leads to changes in blood sugar regulation and hormonal balance and promotes inflammation, all of which stress the body. Sleep deprivation and chronic stress promote further disruptions to the brain’s reward and self-regulation centers. All of these factors lead to cravings (usually for sugar and processed carbs)—which, under these circumstances, require huge amounts of willpower to resist. *Refer to chapter four in It Starts With Food. Research also shows that resisting technology—the “ping” of an email notification, the Facebook chat alert on your iPhone, or turning off the TV when you’ve still got last week’s shows recorded—are especially taxing on our willpower reserve. There is some good news, however. By applying some smart strategies, you can actually make your willpower bank more robust, and make those dollars go further than they used to. Improving your willpower for any given day starts the night before. Make as many small decisions as possible about the following day. Don’t force your brain into burning energy making trivial decisions early in the morning—save that energy for your willpower. Lay out (and iron, if necessary) your clothes; prep your coffee, breakfast, and lunch; and pre-pack your work bag. Decide ahead of time whether you’ll be feeling rested enough to hit the gym, or whether you need the extra hour of sleep. Research the menu for your business lunch so you know what you’ll order. Take as many decisions out of tomorrow as possible—especially the ones involving food. Plan for stressful situations. The brain loves a plan—and without one, it’s quick to revert to its old habits and seek its old rewards. If you’ve got some stressful situations coming up, decide how you’ll handle them with “if/then” statements. “If my pushy co-worker offers me cookies, then I’ll tell her I just brushed my teeth, but thanks.” “If my project really is due today, then I’ll close my email program so I’m not distracted by notifications.” When that situation comes up, simply enact your plan, and save the energy you would have used weighing your options and exercising restraint for another situation. Sleep more. Sleep makes ample deposits into our willpower bank, while sleep deprivation will compromise willpower (via stress). According to most researchers, sleeping more is the most important thing you can do to keep your willpower bank full! Plus if you go to bed earlier, you won’t have to talk yourself out of hitting snooze in the morning. Positive thinking. Easier said than done some days, but research shows that those who think positively, believe willpower can be “strengthened,” and generally have an upbeat mood can stretch their willpower capacity, especially early in the day. Read more about the Law of Attraction or gratitude to learn how to employ positive thinking into your own morning routine. Avoid temptation. If you know every temptation is a willpower withdrawal, you’ll save your “dollars” by having fewer temptations. (And for every technology temptation you’re able to avoid, you’ll save double.) Turn off notifications on your iPhone and computer. If your neighbor’s candy dish tempts you, walk a different way to the bathroom. Tell your family to move their junk food to a special cabinet out of the way, leave the house 20 minutes early to avoid the worst of rush hour traffic, and for the love of Oprah, don’t go to the grocery store hungry. Or angry. Or sad. Or without a list. Employ distraction. In the famous “Marshmallow Test” from 1970, the children who were successfully able to delay gratification (eating one marshmallow placed right in front of them) for the reward of getting two marshmallows when the experiment was over succeeded by employing a variety of distraction techniques. Some covered their eyes, some turned their backs on the tempting marshmallow, and others talked to themselves while looking away. Employ similar distraction techniques when faced with tempting food or social media notifications to make your own delayed gratification easier. Mediate stress. Willpower and stress are inherently incompatible—stress encourages you to focus on immediate, short-term results, but self-control requires keeping the big picture in mind. Chronic stress also impacts the prefrontal cortex, the area of the brain responsible for self-regulation. Under stress, we’re more prone to make poor choices (favoring short-term rewards over long-term goals), so reducing stress is one way to keep our willpower center strong. Control the things you can control—diet, sleep, and exercise/recovery are major areas we can target—and know that even small things help. Meditate. Meditation has been shown to improve willpower in as little of eight weeks of brief daily training. (Perhaps it has to do with your breathing… diaphragmatic breathing activates the parasympathetic nervous system, which helps take your body out of “stress mode.”) Consider learning how to meditate in the moment, and move on to longer sessions as you get comfortable. Move your body. Exercise leads to changes in the brain that support self-control, although it’s not clear exactly how that works. (Perhaps it’s by mediating stress—do you see a theme here?) You don’t have to go all-out or high-intensity for this to work—things like walking, yoga, or playing with your kids outside all do the trick. Here’s one last willpower-preserving, craving-busting technique that you’ll think we just made up, but is actually backed by peer-reviewed research: imaginary eating. A 2010 study by researchers at Carnegie Mellon University found that trying not to think about a particular food (like chocolate) only makes you want it more, but imagining the consumption of that food decreases your appetite for it. So the next time you find yourself walking by the M&Ms on the break room counter, pause, do some belly-breathing, and really visualize yourself eating them. Imagine taking them from the bowl, popping them in your mouth, crunching on the shell, and swallowing the melted chocolate. Scientists have shown that if your imagination is good enough, you’ll be able to walk away from the candy that much easier.